JAKARTA, Indonesia — Several hundred protesters chanted "God is Great" and "Get out, communist!" outside China's embassy in the Indonesian capital on Friday, demanding an end to mass detentions of Uighur Muslims. 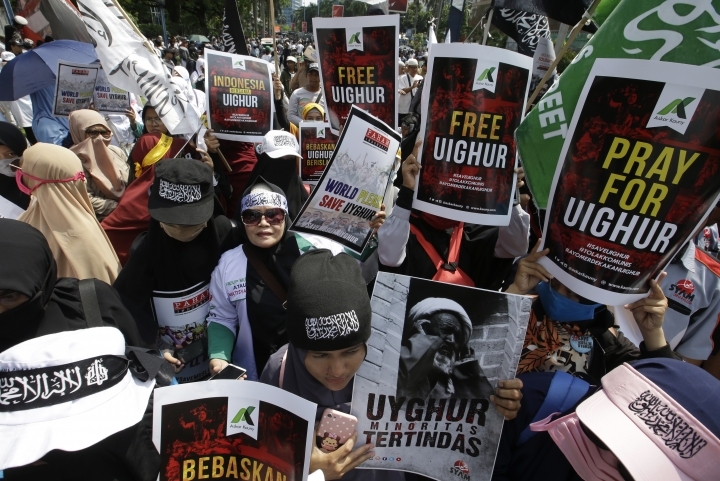 The white-robed protesters, almost outnumbered by police, waved banners emblazoned with "Muslims unite to free Uighurs" and flags bearing the Islamic declaration of faith. 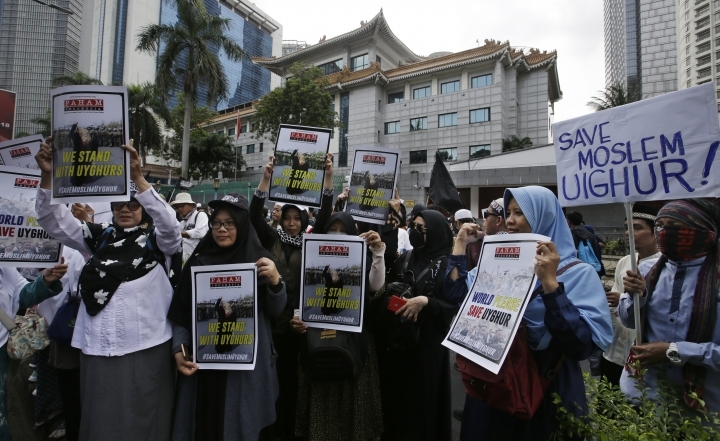 Protest organizer Slamet Ma'arif told the crowd that included members of the Islamic Defenders Front vigilante group that their Muslim brothers were "suffering oppression, torture and cruelty by the Chinese communist government." 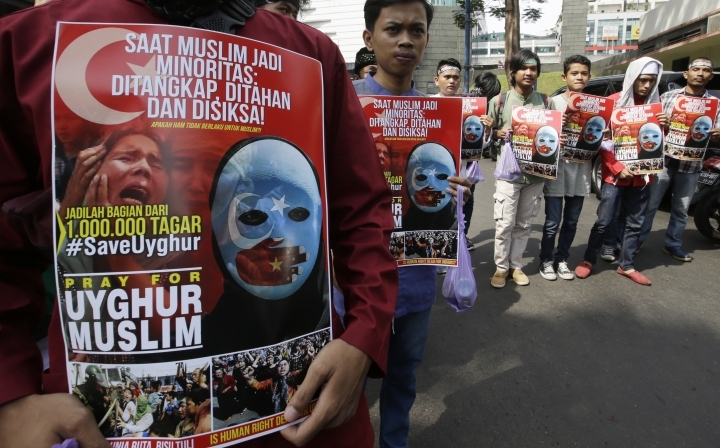 Ma'arif, chairman of a conservative alliance behind the mass protests against Jakarta's minority Christian and ethnic Chinese governor in 2016, said Indonesia, the world's most populous Muslim nation, should expel China's ambassador. "Save the Uighur community and give them freedom to worship as Muslims," he said. 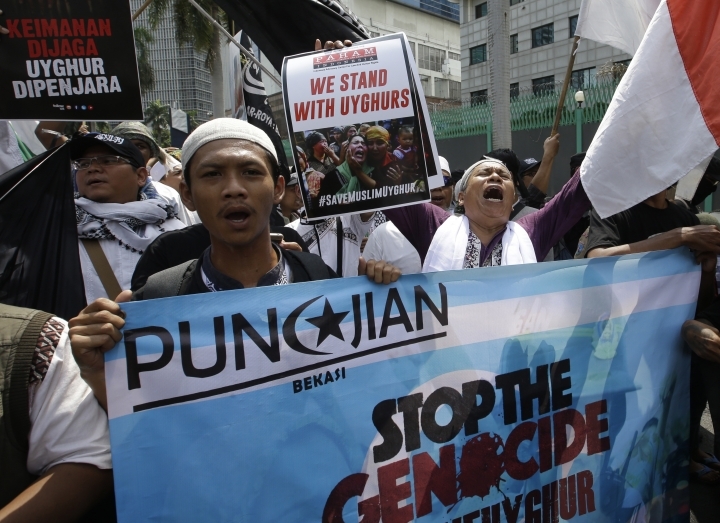 "We also call on the Indonesian government to provide real action to help Uighurs like what has been done with Rohingya and we call on Muslims around the world to provide assistance and support for Uighurs," Ma'arif said. Up to 1 million ethnic Muslims in China's Xinjiang region are estimated to be detained in camps where they are subjected to political indoctrination and pressured to give up their religion. Indonesia's foreign minister Retno Marsudi on Monday summoned China's ambassador Xiao Qian to explain alleged human rights abuses in Xinjiang. Indonesia relayed the concerns of various groups in Indonesia and stressed that freedom of religion is enshrined in the U.N.'s Universal Declaration of Human Rights, according to foreign ministry spokesman Aarmanatha Nasir.